SimplyGo Mini is a reliable, powerful choice in lightweight portable oxygen concentrators. Are you living your life? Taking trips to the store, museum or a musical? Spending weekends away with friends and family? If you use portable oxygen, SimplyGo Mini is a powerful choice for a reliable and lightweight portable oxygen concentrator that can help you do what you want, when you want. Philips built SimplyGo Mini to be tough. During development, SimplyGo Mini was rigorously tested in real world environments including impacts, vibrations, and temperatures to deliver reliable performance day in and day out. From a walk in the park to an overnight trip, SimplyGo Mini may help you remain active and provide you with flexibility while on the go. Standard battery for battery duration up to 4.5 hours* (pulse setting of 2 at 20 BPM). Resulting in total SimplyGo Mini weight of 5 lbs. Extended battery for battery duration up to 9 hours* (pulse setting of 2 at 20 BPM). Resulting in total SimplyGo Mini weight of 6 lbs. With its sleek, lightweight, and non-clinical design, SimplyGo Mini doesn’t draw attention to itself. A stylish case is included for a comfortable way for you to carry by hand or over your shoulder. Want to go hands-free? With an optional backpack specifically designed for SimplyGo Mini, you have a comfortable way to do it. 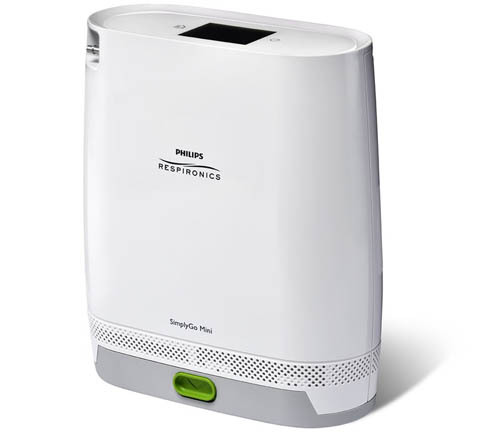 When choosing Oxygen Choice you have the confidence that your oxygen concentrator, whether it be the Philips Respironics Simply Go portable oxygen concentrator or a different model, it will be delivered to your door by a trained technician who will explain all aspects of your machine including initial setup, recharging, power management, safety tips and oxygen settings. It’s all part of the our service.